Collared Lizard (Mountain Boomer) Crotaphytus collaris. The Mountain Boomer, or Collard Lizard, is a pretty turquoise blue collar except for its head and neck, which is bright yellow with black stripes along its neck. 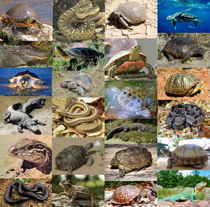 It was adopted in 1969 as the Oklahoma State Reptile. The eastern collared lizard (Crotaphytus collaris), also called common collared lizard, Oklahoma collared lizard or collared lizard, is a North American lizard that can reach a foot (30 cm) in length (including the tail), with a large head and powerful jaws. They are well known for the ability to run on their hind legs, looking like small theropod dinosaurs. Found in Missouri, Texas, parts of Arizona, western states, and parts of Kansas, the collared lizard is the state reptile of the United States state of Oklahoma, where it is known as the mountain boomer. The name "collared lizard" comes from the lizards' distinct coloration, which includes bands of black around the neck and shoulders that look like a collar. 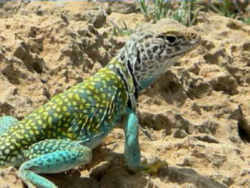 It is a member of the collared lizard family. Identification: A large (up to 35 cm TL), green, blue-green, or straw yellow lizard with a light belly and an orange or yellow throat. Back usually covered with small light spots (except in juveniles, which have dark crossbands). Male much brighter than female. Key Characters: Large head; narrow neck; long, round tail; two black collars on the back of the neck. Similar Species: A distinctive species not easily confused. 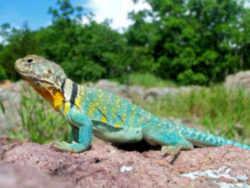 Subspecies: Eastern collared lizard, C. c. collaris. 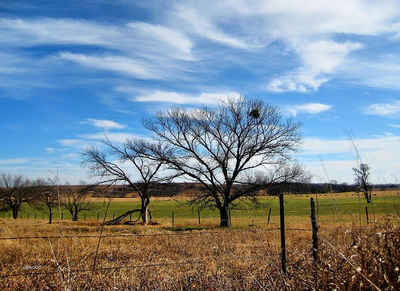 Habitat: Bluffs, rock ledges, and rocky forest openings (glades). Natural History: This lizard looks like it would be more at home in the deserts of Arizona than in Illinois. Male frequently sits on the top of the highest rock in its home range as if to advertise its presence. Mating takes place in the spring and eggs are laid in late June to July. Clutch size is normally 3-10 eggs and the hatchlings (ca. 9 cm TL) appear in August or September. Collared lizards feed on insects (especially grasshoppers) and small lizards. The main predators are snakes and hawks. Oklahoma designated the collared lizard (Crotaphytus collaris) as the official state reptile symbol in 1969. Also called 'mountain boomer' because it was once mistakenly thought to emit a sound that echoed through mountain valleys. 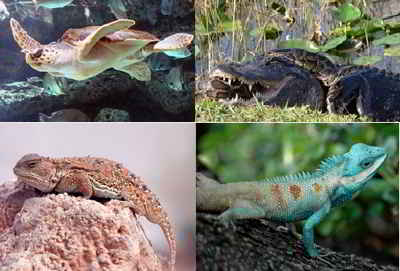 Species: Crotaphytus collaris (Say in James, 1823) - Collared Lizard, Eastern Collared Lizard, Lagartija-de collar com?